For the past few years, Cascadia Consulting Group has been working with the Vietnam Institute of Urban-Rural Planning (VIUP) and other government agencies to customize a Climate Impacts Decision Support Tool (CIMPACT-DST) for use by urban planners across Vietnam. This software tool helps planners quickly and easily identify and address anticipated climate change impacts—such as sea level rise, coastal erosion, temperature increase, and precipitation change—that could threaten specific projects or plans. The tool has already been used to adjust several master plans. Last year, we fully transferred tool ownership to VIUP. The tool always has up-to-date information (in the near term, this includes incorporating IMHEN’s updated Climate Change and Sea Level Rise Scenarios, expected in late 2015). The tool is populated with adequate local information for trained provinces, including six that we trained on this trip: Hai Phong, Ha Tinh, Lam Dong, Tien Gang, An Giang, and Ca Mau. Local administrators know how to improve and maintain tool function to meet evolving needs. The tool has scaled from the pilot in Hue (2012) to cities and provinces across the country. Tool use continues to expand geographically, and in terms of the type and number of users. The tool is used consistently. Results are shared and communicated – both between provinces, and to international audiences. On this April visit, Andrea and Thu convened several stakeholder meetings, including one with UCR-CoP members, to get feedback on a key component of our sustainability plan: a sustainable tool use and maintenance mechanism. This mechanism, as currently envisioned, has two components. One will facilitate information exchange between urban planners and the climate science community. The other will link tool users and administrators at the local level with those at the national level. The specifics of how these two components will work are being further refined. We are also talking with the implementers of other development projects across Vietnam, to identify places where applying CIMPACT-DST could help incorporate greater climate resilience and protect ongoing investments. 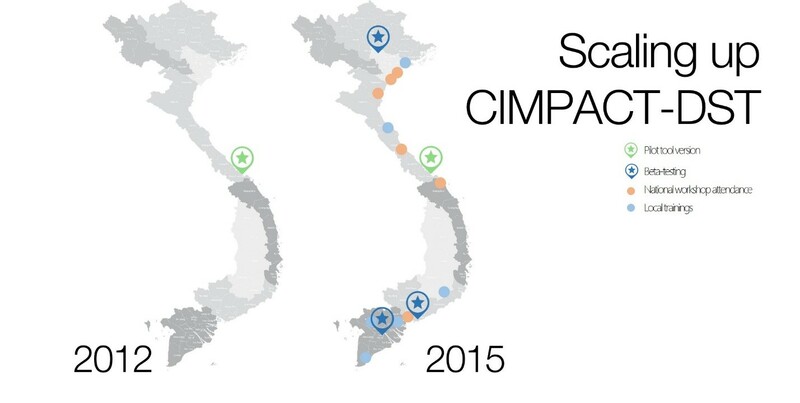 The customized Vietnam CIMPACT-DST has no license fees and is free and easy to apply; we hope that many institutions and communities will find it useful in thinking about how to deal with the emerging risks posed by climate change. Please contact us (thu@cascadiaconsulting.com) if you are interested in talking about how the tool could fit into your work. The Cascadia team will return to Vietnam in early June to finalize the sustainability plan and ensure that VIUP has the resources and tools it needs to keep CIMPACT-DST relevant and useful for Vietnam urban planning moving forward. For more information on how the tool has been used, see this USAID Frontlines article. This entry was posted in Climate Change, Urban resilience and tagged Andrea Martin, CIMPACT-DST, urban resilience, Vietnam. Bookmark the permalink.